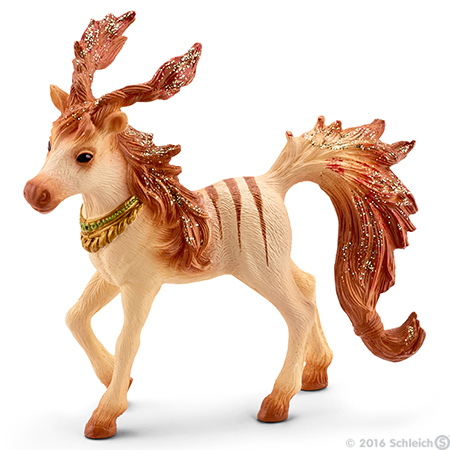 Marween’s Striped Foal Figurine from Bayala series. Made by Schleich in 2016. Marween has put a golden ribbon on her striped foal. Marween found the striped foal during one of her adventures. The foal looked lonely and afraid, but she quickly came to trust the elf. When Marween took her home, the beautiful animal really began to flourish. She now races around Marween’s house every morning and accompanies the elf everywhere. She has even learned a few little tricks: she can walk a few steps on her hind legs, roll over several times or hop sideways. “It’s amazing how talented you are!” Marween says happily, giving the foal a crunchy apple.